Every day, nearly one-third of U.S. children aged 4 to 19 eat fast food, which likely packs on about six extra pounds per child per year and increases the risk of obesity, a study of 6,212 youngsters found. The numbers, though alarming, are not surprising since billions of dollars are spent each year on fast-food advertising directed at kids, said lead author Dr. David Ludwig, director of the obesity program at Children's Hospital Boston. 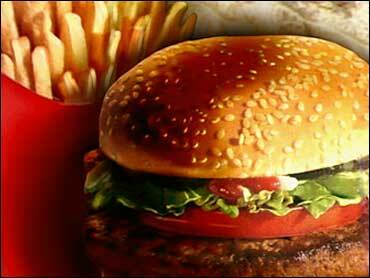 The findings suggest that fast-food consumption has increased fivefold among children since 1970, Ludwig said. The nationally representative study included boys and girls from all regions of the country and different socio-economic levels. The highest levels of fast-food consumption were found in youngsters with higher household income levels, boys, older children, blacks and children living in the South. The lowest levels were found in youngsters living in the West, rural areas, Hispanics and those aged 4 to 8, but more than 20 percent of youngsters in each of those groups still reported eating fast food on any given day. Fast-food lovers consumed more fats, sugars and carbohydrates and fewer fruits and non-starchy vegetables than youngsters who didn't eat fast food. They also consumed 187 more daily calories, which likely adds up to about six pounds more per year, the study found. The results are based on children questioned in government surveys from 1994 to 1996 and 1998. The study lacks data on the children's weight. Children's current levels of fast-food consumption probably are even higher because of an increase in the number of fast-food restaurants and in fast-food marketing since the late 1990s, Ludwig said. The study appears in the January issue of Pediatrics, published Monday. The nation's obesity epidemic has focused attention on fast-restaurants, and while recent class-action lawsuits attempting to blame McDonald's Corp. for making people fat have failed, many chains have begun offering healthier fare. Recent data suggest that nearly 15 percent of U.S. youngsters and almost one-third of adults are obese. The new study results bolster evidence that fast food contributes to increased calorie intake and obesity risk in children, Yale University obesity researcher Kelly Brownell said in an accompanying editorial. Brownell said the study refutes a July report from the U.S. National Chamber of Commerce, which includes fast-food companies, that suggested fast-food restaurants "are not a chief culprit in the fattening of America." Brownell said there are encouraging signs that policy-makers are taking action to protect children from the fast-food trend, including efforts to limit soft drink and snack food sales in schools, and to curb food advertising aimed at children.